How many times have I scoured books and the internet for a solution to that horrible bane of crocheting in the round - the unsightly and very visible seam? Many...too many. Despite my never finding a good answer, I keep on researching and experimenting. The only real answer I've been able to find is that, when it comes to crocheting in the round with the single crochet stitch, you're going to have a seam. That's it. Well, that's not good enough, I say! The good news is that I have found two solutions that I can make do with for now. The first is labor intensive, but looks really great: brought to us by Sarah London. The only problem with this one is that you have to cut the yarn after every round (though the results are worth it, I have to say). Make a magic circle with the desired number of stitches and pull it tight. Slip stitch into the 1st available sc stitch to complete the circle. Pull the slip stitch very tight. Chain 1. Pull the chain stitch as tight as you can get it. SC into the SAME sc stitch. You can put a stitch marker in this stitch so there's no confusion later (at least for the first time). 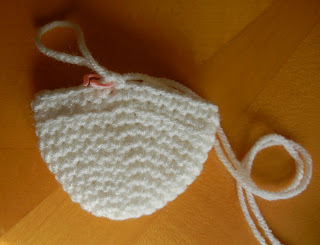 Continue as per your pattern until you get to the last stitch of the round. Slip stitch into the sc stitch from Step 4. You will be skipping the ss and chain. As before, pull the slip stitch very tight. Repeat Steps 4-7 as many times as needed. If you have the magic method to make an invisible seam, PLEASE PLEASE PLEASE share!! Hope this was helpful - happy crocheting!